This article will present a step-by-step method for dyeing wool yarns, using an ordinary microwave and synthetic dyes. The results are bright and beautiful, or subtle and soft--whatever you prefer, your palette is limited only by your imagination! First, a note on dye safety, and see the tutorial on dyeing protein fibers safely before you start. Use an old microwave that you don't use any more for any cooking or reheating of food or beverages. Make sure the area you work in has good ventilation, but is not drafty. Keep your dyeing utensils separate from cooking and eating utensils. Don't prepare, reheat, or eat food in the area where you are dyeing. Dyeing with synthetic dyes is not inherently dangerous, unlike certain mordants used in natural dyeing which are quite poisonous. But it's sensible to be cautious in the absence of definitive information about the safety of synthetic dyes. A microwave that won't be used for food preparation. A dish tub or other fairly shallow, open, plastic container that will fit in your microwave--and won't be used for food preparation or dishwashing, etc. 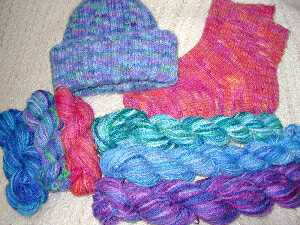 Yarn, preferably well washed, up to four ounces per batch dyed. Note: these instructions cover only protein fibers such as wool, mohair, angora, llama, etc. I haven't tried this method on silk, and dyeing cellulose fibers like cotton and linen require different dyes and methods. Containers to hold and apply the dye. If you or a friend uses hair coloring products, the application bottles are great for 'painterly' effects, allowing you to apply small dots and stripes. You can also use disposable cups for large areas of solid color. Cardboard ones work for one or two jobs. Plastic cups will last almost indefinitely. Dye, preferably the weak-acid type, in powder form. If you use other dyes, you'll need to experiment to find what works best. Water and vinegar or citric acid crystals or whatever else your dye needs to help the dyeing along. A microwave-safe container that can hold boiling water, and which will fit in your microwave beside the tub used to hold the fiber. It should not be used for food preparation, even though it won't hold dye, because dye can move in the steam and land on other surfaces. Paper towels, newspapers, or other disposables to cover your work area. An old absorbent towel like a dishtowel to line the bottom of the tub. Measuring spoons dedicated to dyeing use only. Prepare the yarn for dyeing by winding in a skein and tying it loosely in 3-4 places, and then washing it if necessary and then rinsing and draining (it doesn't have to be dry to start). You can also dye a ball of yarn with the understanding that the center of the fiber won't be colored as much as the outside. Wet your yarn. It's best to soak for at least 30 minutes in a sink, basin, or bucket of warm water with a small dash of dish detergent, which acts as a wetting agent. Also, add some of your acid to the soak water. I use a couple tablespoons of citric acid crystals, just as I do for dyeing a full pot of fiber. A couple 'glugs' of vinegar will work, too. While the yarn is wetting, mix your dyes. I use Ciba Kiton synthetic dyes exclusively. They are much less expensive than premixed dyes, and the colors can't be beat. Ciba Kiton dyes are the only ones I know of which offer a true magenta and a true cyan, allowing a much larger palette of bright secondary colors than red and blue do. CK dyes are also very lightfast--meaning they don't fade much when exposed to light--and quite washfast--meaning they don't bleed out much when exposed to water, after the initial wash and rinse after dyeing. Choose some sort of container to hold the mixed dyes that will allow you to pour or squirt small amounts just where you want them. Hair coloring application bottles or plastic cups work very well. Choose the colors you want to mix. It's easiest in the beginning to stick with an analogous color scheme. This is two or more colors that reside side-by-side on a color wheel. For example, magenta, purple, and blue are analogous, as are pink, peach, and yellow. More complex color schemes can be done, but it takes some practice to make sure the dyes don't mix too much and make a muddy mess. Place about 1/2 tsp total of your dye powder in each applicator used--so, if you're mixing two or more powders to get the colors you want, you're using very small amounts of each color. I usually use eight or more colors for each project. I generally stick with an analogous color scheme, but might use several blues and greens, for example, rather than just one of each. Next, add some acid to each container. If using citric acid crystals, add about 1/4 tsp to each applicator. If using vinegar, add about 1/4 cup to each applicator. Now add hot water to each container, a tablespoon or two. Stir or shake, according to what sort of container you're using, until all clumps of dye powder are dissolved. If lumps remain, they may plug the opening of the applicator bottle, or if they deposit on the wool, they will cause a small, very dark spot of dye to stain the fiber. After thoroughly dissolving the dye, fill the bottle or cup nearly to the top with water--warm or cool. You can also use dye stock solutions. Depending on their strength, you may need to dilute them somewhat. I make 1% solutions, and don't usually dilute them unless I want a pastel color. After the yarn has soaked thoroughly, squeeze (gently!) or spin out the excess water. Too much water left in the skein will cause the dye to pool at the bottom of the bin. Spin out in your washing machine to reduce pooling colors. Hold the skeins together evenly. Anchor one end on something--a doorknob, someone else's hands, etc. Holding the other end of the loop with both hands, roll the bottom of the loop away from you. This will twist the two skeins together. It might be easiest to try this with contrasting skeins first, to see the effect. Along both sides of the yarn, the skeins will have a barberpole stripe effect. This process allows both skeins to dye with nearly identical coloring. Place your old dishtowel in the bottom of the tub. This will absorb some of the excess dye that drips through the yarn, helping to keep the bottom side of your skeins from becoming muddy. Now lay the skeins in the bottom of your tub. They will usually need to overlap a bit. I arrange one loop of the yarn around the edges of the bin, then lay the other half of the skeins down in the center of the tub, as nearly as possible keeping a single layer of the twisted skeins throughout. Easy does it the first few times! Squirt or pour the dye mixture over the fiber in the tub. You're aiming to saturate the fiber, but not to the point where it drips through, filling the bottom of the basin, and making the underside of your skeins very dark or muddy in color. On the other hand, if you don't add enough dye, few of the fibers will be colored when you're done. If you have a towel in the bottom of the tub, you can err more on the side of too much dye rather than too little. But stop! if you see dye beginning to pool in the bottom of the bin! I like to apply my dye in random splotches, starting with the lightest, brightest colors first. So if I am using magenta, orange, and yellow, I start with yellow. When I have about as much yellow as I like, I pour or squirt how much orange I want, making sure that I leave some plain white areas for the magenta. Finally, I cover those white areas with magenta, and maybe add some magenta to some of the orange and yellow areas, to make more shades of each color. I have found that I prefer the skein to be completely colored; I don't usually care for the contrast of white with color when on yarn. Others like that contrast, so you can decide for yourself what you prefer. If you leave some white, accidentally or on purpose, and decide you don't like it after dyeing, there's a way to easily take care of it which I will explain at the end of the next step. It's finally time to "cook" your fiber! Place the tub in the microwave. Fill the other container about 3/4 with water and put it in the microwave, too. It will act as a heat sink so your wool won't actually scorch--yes, you can actually dry your yarn while zapping to the point where it might scorch without a heat sink. As they say with microwave dinners and popcorn, it's possible the results will vary depending on the wattages of your microwave. Mine is about 600 watts; if yours is less, you may need to "zap" your fiber longer. I set my microwave to run for 6 minutes. When it is done, I turn the bin around, and zap it another 6 minutes. I turn it around again and zap again for 6 minutes. Why 6 minutes? Because it's the longest period of time that I can zap for by hitting one button on my microwave :) I do find I need at least 15 minutes total 'cooking' time to make sure most of the dye is permanently attached to the fiber. Less time seems to cause a lot more dye to rinse out. And that's usually all it needs! It's amazingly fast! And the dye is, in fact, fast--I've had no dye bleed out after the initial washing right after dyeing it if it zapped at least 15 minutes, and it seems to be just as light fast as if it were immersion dyed for an hour in a pot. Take a look at your skein. Do you like the way it looks? You can add more color and zap it again if you like. If there's lots of white or light areas you don't care for, you can add some water and acid to the bin, to immerse the skein, and let the excess dye that soaked into the towels dye those light areas darker, bearing in mind this will change the colors somewhat. When you're pleased with the skein, wash it in hot water with a little detergent, just like any other time you dye. Spin out the excess, hang to dry, and you'll have a beautifully unique randomly-colored skein to use or just admire. When you've tried this process a time or two, you may wish to work with more subtle combinations of colors, or an extended analogous scheme, or even a color combination including more contrast of hue. Subtle colors can be mixed in the applicator bottles--an easy method is to mix a bright version of the color you're interested in, say green, then add just a touch of its complement or opposite color on the color wheel--in this case, red or magenta. Mix together well, then touch a drop of the combination to a piece of absorbent white paper. That will give you a preview of what the color will be like on white fiber. You can also dye over light browns or grays for a very subtle and rich effect. Extended analogous color combinations might be something like purple, red, orange, and yellow. The yellow and purple are opposites on the color wheel. If they mix together on your yarn, you will get a brownish, muddy color. If you want to avoid that, apply your dye as explained above, lightest colors first, making sure the opposites never touch on the skein, then place medium colors around the lightest. In order to have lots of the darkest color, leave plenty of white areas between the medium colors. In the case of purple through yellow, dye your yellow areas first, then use the orange, allowing it to touch the yellow most of the time. Next red, which will touch the orange and sometimes the yellow. At this point, all yellow is surrounded by red and orange, so it won't be overwhelmed by purple dye, and the purple won't be muddied by the yellow. Finally, dye your purple in the remaining areas of white. Color combinations which are analogous but also use the complement or opposite of the main hue are particularly pleasing, and only a little trickier than the extended analogous color schemes. Let's say you want to dye purple, blue, and green, with a hint of orange, as the complement of blue. As usual, lightest color first, in this case, orange. Dye small areas orange, and surround them with a touch of yellow--a sort of buffer zone. Use blue or green next to the buffer zone, allowing them to bleed into the yellow slightly, but not quite all the way to the orange. Finally, add your purple, well away from the buffer zones. If there are remaining undyed areas, fill in with the blue and green. One of the nice things about this type of dyeing is the colors don't "migrate", or bleed into their neighbors, much. As long as you don't saturate the fiber to the point where dye is pooling in the bottom of the tub, you should be OK. I could hardly believe how simple microwave rainbow dyeing was when I first tried it! So fast, so bright, so beautiful, so easy! I've really enjoyed knitting with the yarns, too. The biggest problem is the difficulty of getting similar results on more than about four ounces of fiber at a time. If you want to dye for a large project--maybe a sweater--I recommend you take notes as you go along for every step of the way, even down to where you apply which dye color on the yarn. Then, when all are dyed and ready to knit, knit a round (or two rows) using a skein from one dye batch, then a round or two rows from a different dye batch. This will spread out any inconsistencies of color. Or, if the yarns turn out very differently from each other, use that as a design feature in your project. Ribbing in the darkest yarns, lightest near the neck, medium for body and sleeves, for example. Have fun with your microwave rainbow!